OOPS! 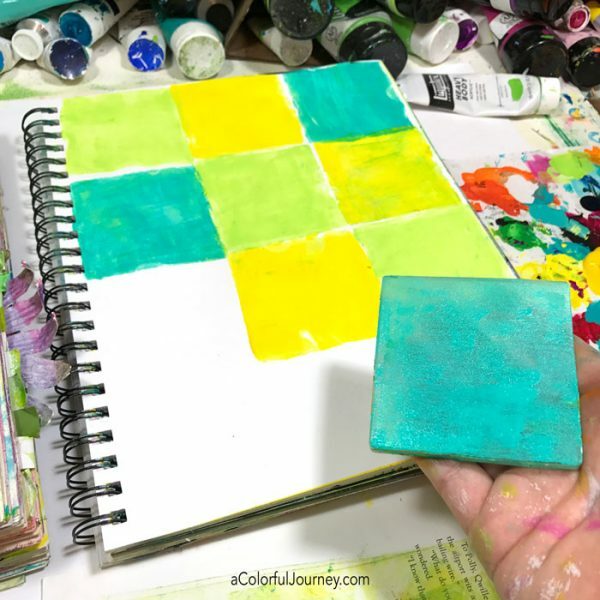 The plan was to build the grid with 3 colors by having each color in each row and no color touching itself. I thought it was a solid plan. It wasn’t, since after row #2, I was backed into a corner. Okay, that sounds a bit dramatic but for a fleeting second that is how it felt until I said O.O.P.S. (Outstanding Opportunity Presenting Suddenly). When I finsihed the grid with the Cutouts Inspired by Matisse stencil, I realized that this grid was far better than the one I planned. Using a square Gel Press Plate to build the grid had a side benefit. Often, when gel printing, the clean up pages become wonderful all on their own. 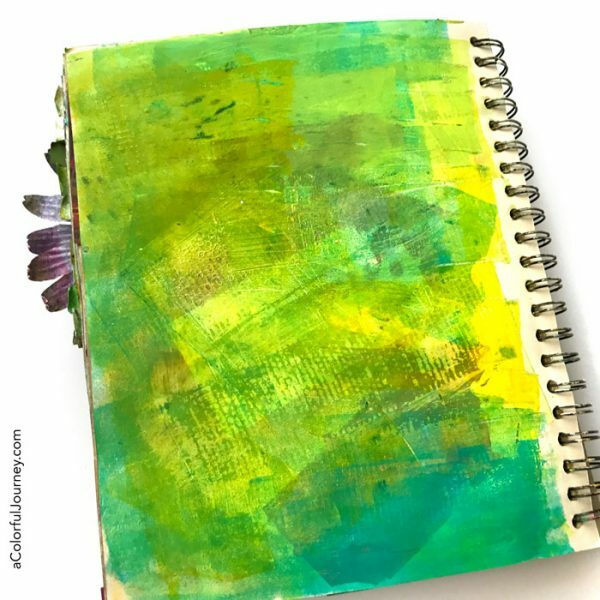 In the video, you’ll see a brownish blah page become layered with color just from cleaning off the brayer along with tips for how to stencil crisp images. 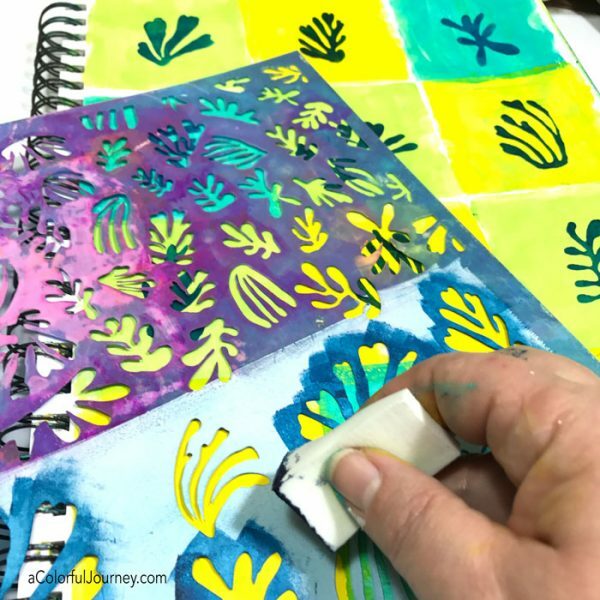 Watch Making an art journal page with a gel plate and a Matisse inspired stencil on YouTube. New to gel printing? I’ve got a step by step guide for making your first print. Apparently, geometry was not my strength in school. The proof (yes, pun intended for those who also dreaded writing those in geometry) is that I turned the gel plate square in the video so that it would fit better…um…squares are the same length on each side. Getting a crisp stencil image is easy as 1-2-3. Use small amounts of paint or a thick paint, like a heavy bodied paint. 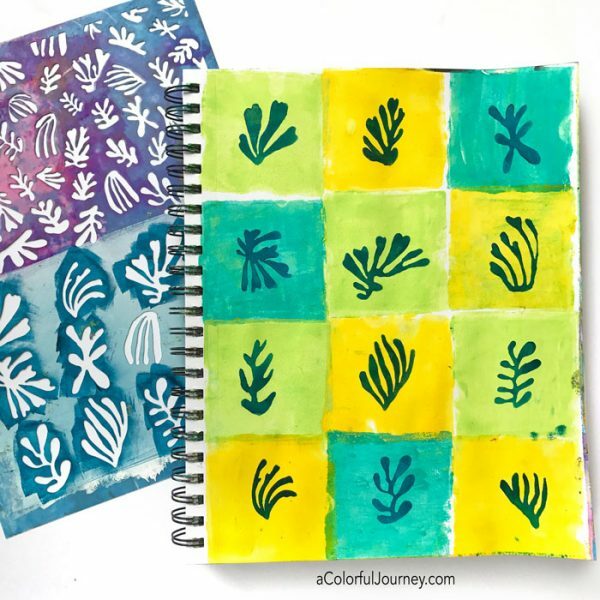 If using a thinner paint, just blot the sponge off on scrap paper before stenciling. Pounce the cosmetic sponge in an up and down motion and not side to side because that is more likely to force the paint underneath it. Use light pressure when stenciling. Pushing down with lots of pressure does make it go faster, but it is more likely to make paint squish under the stencil. Here’s the clean up page created by just cleaning the brayer over and over on a page that had some yucky brown on it. Now I have an interesting background ready to go for another play session. Any thoughts on how to make a tessellation background for an M . C. Escher project???? You could do green yellow blue, then YGB, then BGY, then GYB, but that would end up looking like diagonal stripes, which is not what you wanted. This is a classic maths/computing problem! Also, this is super pretty. Hi, I signed up for the pdf guide and keep getting sent to this website. What am I missing? I am a regular reader and enjoy your colorful style. Thanks. You always surprise me Carolyn and make me happy when I watch your videos. I really like the grid and your Matisse stencil. How did your bathroom turn out?did you put the stencils on that wall?